Food & drinks menu = expected. Pillow menu = cool, but, kind of old news… Room menu, where you choose your suite-turned-art-gallery by the artist who conceived it? Now that is unusual! 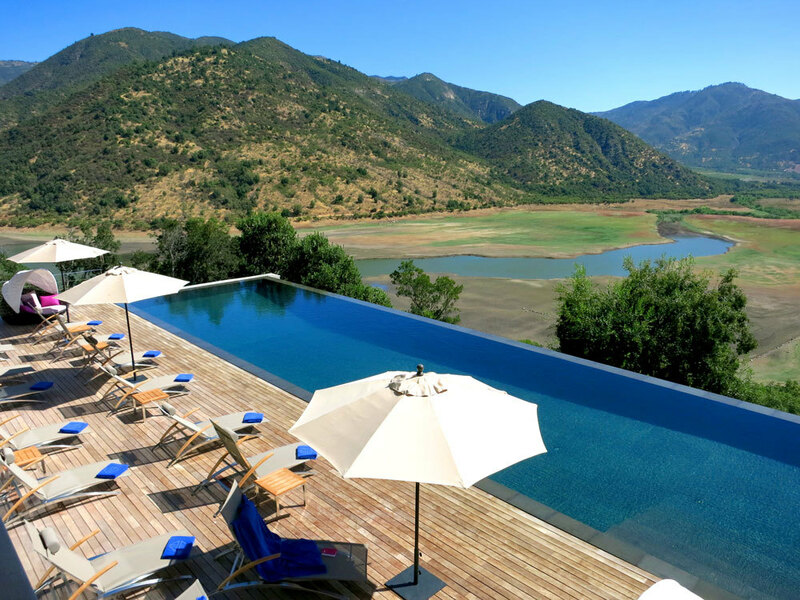 90-minute south of Santiago, deep in the wine country, lies VIK Chile’s luxury retreat, avant-garde winery and spa. 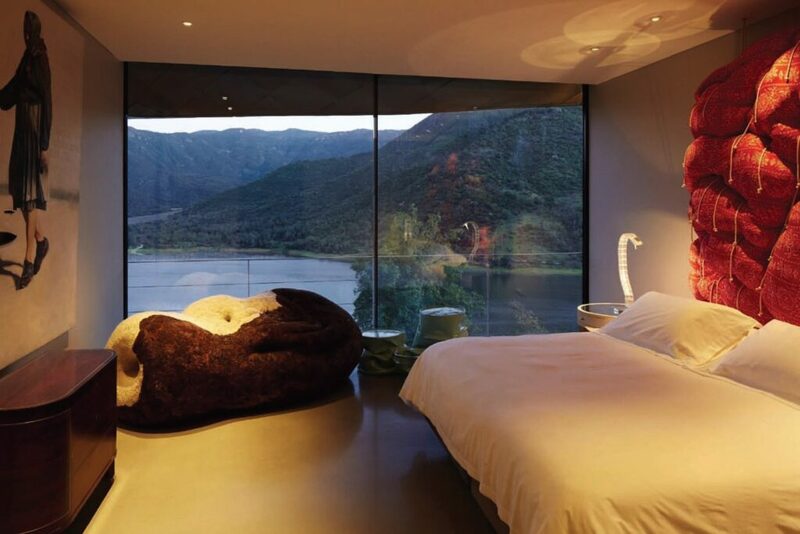 The property’s contemporary design rivals that of the most extravagant Bond villain lair, with a sculptural titanium roof mirroring the shape of the mountains behind it, overlooking a wide valley and lagoon in the heart of a 4,325-hectare vineyard. The main house features a central courtyard, zen garden and library, with all bedrooms on the same floor leading off the courtyard. 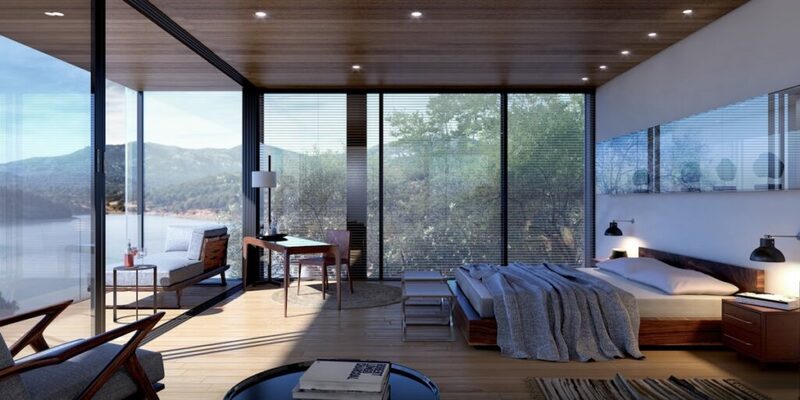 Whilst each room has an entire glass wall to take in the incredible surrounding scenery, spring for one of the Master Suite located on the corners of the building for an incredible panoramic view through two full glass window-walls. December 2018 sees the launch of a sister property working in tandem with VIK Chile: PURO VIK. A collection of glass houses set in the steep hills below VIK Chile are the highest suite category on the property, with an amazing vantage point to capture the dramatic natural surroundings. Each house has 3 glass walls, luxurious hardwood floors and a private terrace with a deep outdoor tub. Roofs are camouflaged by grass, or fitted with solar panels depending on their exposure. Marble bathrooms are discretely separated from the bedrooms with handmade Japanese washi paper. Along with wine-tasting, spa treatments and gourmet picnics; hiking, mountain biking and horse riding are the best ways to enjoy the mountain forests and vine-sewn hills of the beautiful Millahue Valley. 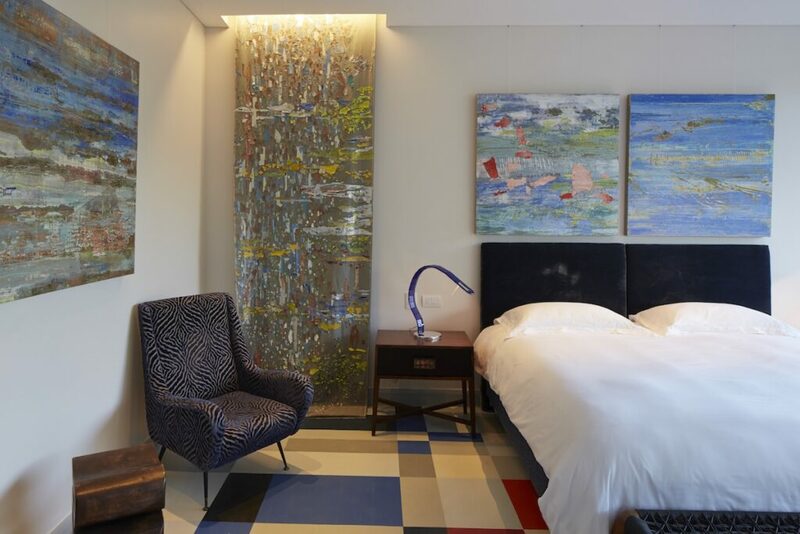 Step into your private art gallery and gaze across stunning works from a soft king-sized bed positioned to enjoy not only the creations within your room, but also the arresting mountain and lagoon scenery beyond the floor-to-ceiling windows that span an entire bedroom wall. 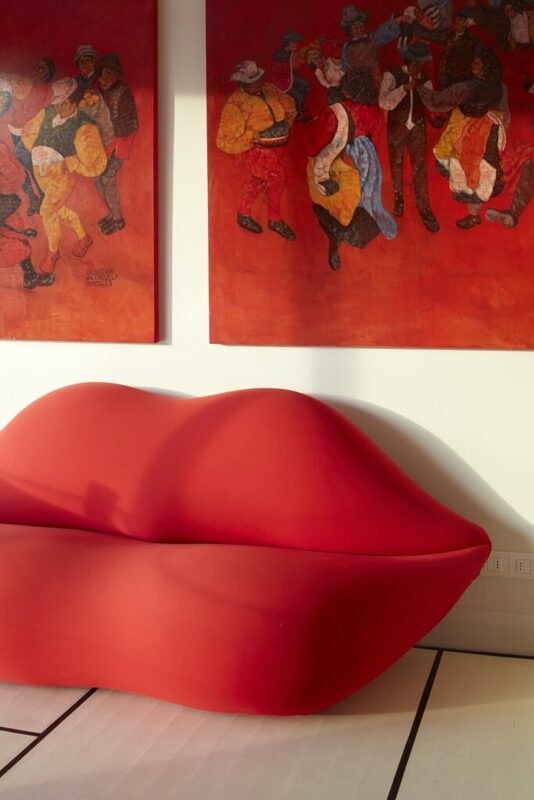 La Marcela Suite, the creation of Santiago artist and sculptor, Marcela Correa, houses depictions of the legend of “La Difunta Correa” portraying the “Chilean Antichrist”, a renowned homeless character in Santiago. The artist has included phrases written above her works from stories the subject recounted to her on the disorder of their life. 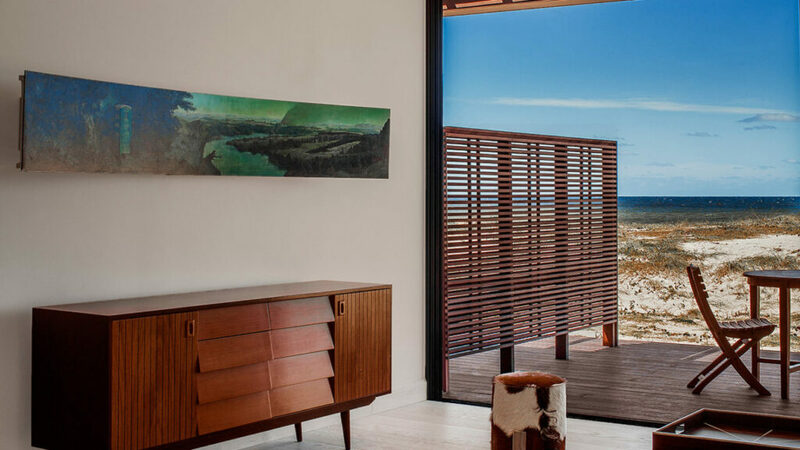 A copper-coloured painting is homage to both Chile’s strongest industry, as well as its landscape, and the artist has used recycled mirrors and metal drums to create bespoke furniture. La Marcela Suite’s bathroom is a much calmer space; with an earthy, cave atmosphere, designed with bare cement walls and a deep carved-stone bath tub for soaking in quiet contemplation. With such cool and calming colours, the tub looks so cosy and smooth you could almost sleep in it! 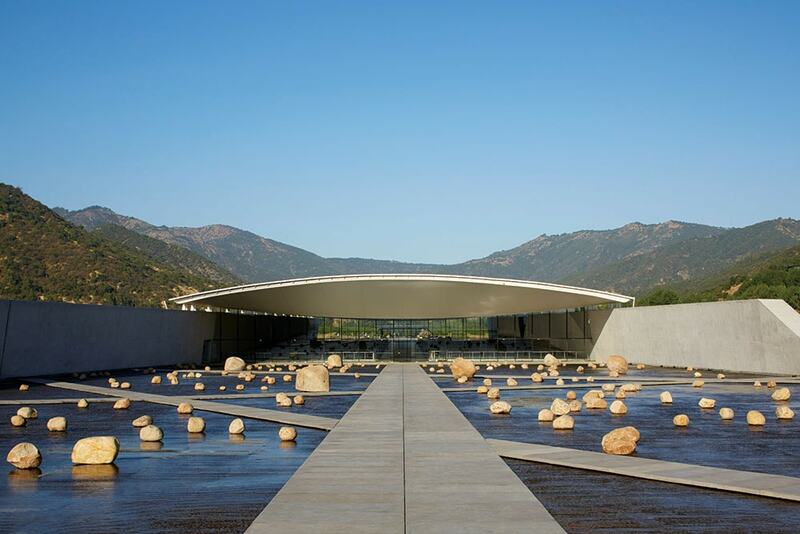 Married to the architect behind VIK winery, Correa is a highly celebrated Chilean artist with works on display in a number of Chilean museums and galleries. Blue oil on canvas paintings hung above a king-sized bed are reflected on the opposite wall by a stretch of crumpled linen, painted in peaceful shades of blues, depicting the light and colour of moving water – a technique also used in the corner of the room to create a water ‘cascade’. 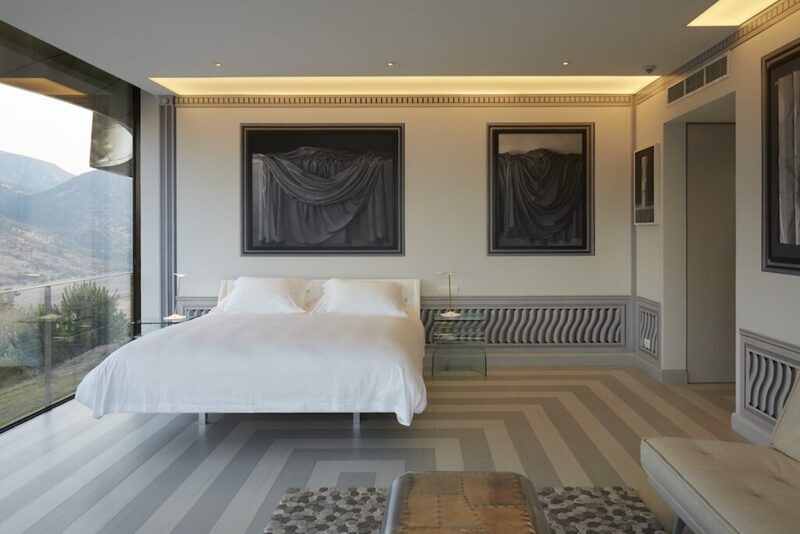 La Patricia Suite’s floor pattern is bolder; a tetris puzzle of block colours, specifically chosen to complement the room’s emotive paintings. With an entire glass wall to one side taking in the beautiful scenery of the wine country and another statement wall that’s painted entirely in a soothing shade of sky-blue, La Patricia is a relaxing space and one of our favourite Suites at Viña VIK. Artist Patricia Fernandez, a graduate of Fine Arts at the Pontificia Universidad Catolica de Chile, is known for her pictorial style. Her concept of the bedroom was to be very feminine, based on water, whereas the bathroom’s ambience is less soft, with cooler materials and tones, creating an almost contradictory space within the Suite. 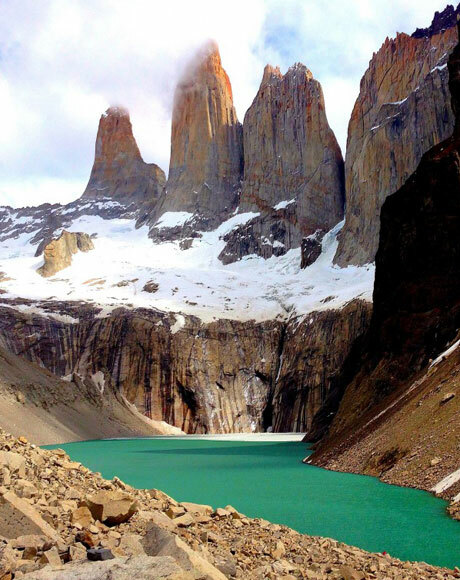 Chilean Artist, Alvaro Gabler, works with Artespacio Art Gallery and Arte Aninat Boulevard in Santiago, and Bosque Nativo Art Gallery in Puerto Varas. He created everything for the Grisaille Master Suite on the island of Chiloe where he currently lives. Gabler is devoted to creating works that demonstrate the beauty of nature with Realism, using everyday objects to highlight an idealised world, with the use of light. Contrary to his usual style of bright colours, Gabler has used varying tones of grey at the special request of owner, Alexander Vik, which gives Grisaille its very minimalistic aesthetic. Gabler pays great attention to the fine details of each object he portrays in his works, and the portraits on display in Grisaille are close to photorealistic perfection. This series of paintings depict draped materials; curved cloths confined within sharp, boxed frames. The simple, light tones within the Suite cleverly emphasise the rich colours of nature outdoors. His creation is complemented by the floor design by Exequiel Fontecilla, a Chilean artist who has designed and painted several other VIK floors. This is a beautiful Suite and we particularly love the shower with a view. 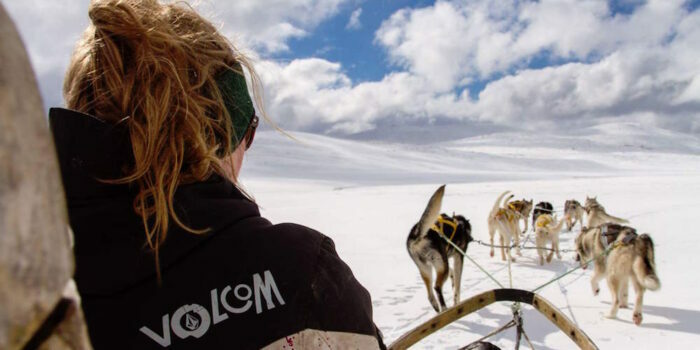 Norge: A cosy hideaway and nod to the Vik family’s Norwegian heritage. 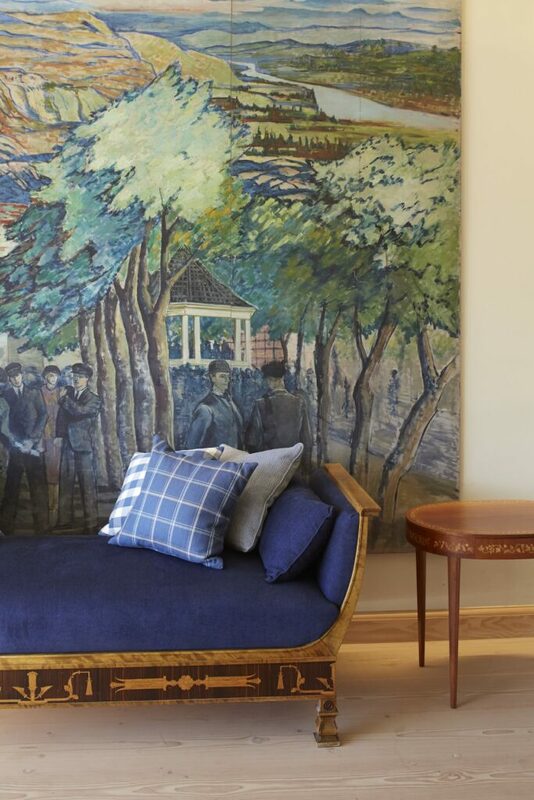 The space is warm and wintery with deep blues and greens, tartan checked-cushions and wall paintings depicting traditional country scenes. Slate and stone is used in the bathroom to give a very natural ‘outdoors-in’ style. 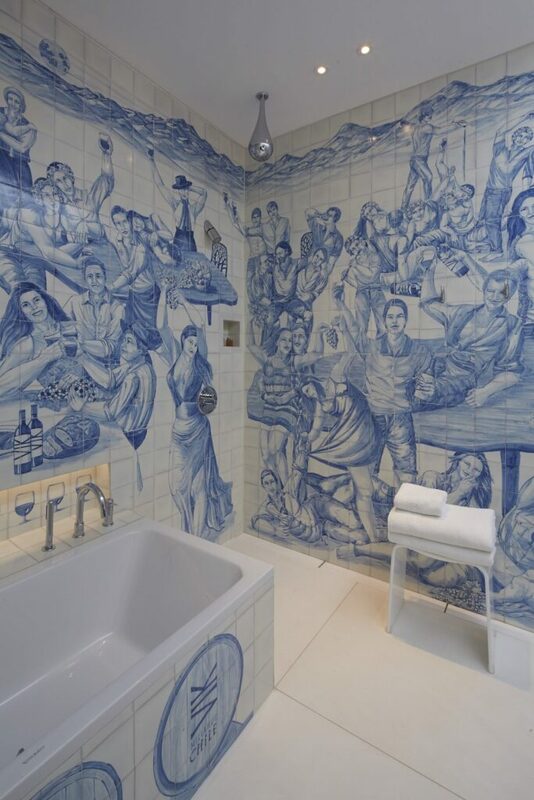 Azulejo Suite: Home to one of our favourite bathrooms – the Vik’s worked with an artisanal company from Portugal to design original hand-painted tile murals to decorate the walls in traditional blue and white.